(Asheville, NC – July 9, 2018) – AquaTech Imaging Solutions, a leader in professional photographic accessories, has chosen Darby Communications as its PR agency of record, effective immediately. Since 1998, AquaTech has been on the forefront of designing and manufacturing Sport Housings for cameras in extreme aqueous environments. 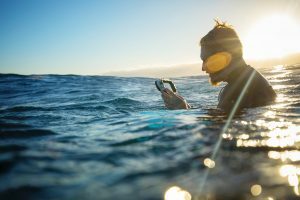 AquaTech has expanded their offerings, launching the AxisGo water housing for the iPhone, allowing creatives of all skill levels to transform their iPhone into a professional grade underwater camera. “We are proud to represent AquaTech as their dedication to quality, innovation and customer service is evident in their passionate customer base of creative professionals,” states Darby Communications Founder, Coral Darby. “Our team looks forward to working closely with them to share the revolutionary AxisGo.” The agency will provide PR for AquaTech’s new AxisGo housing, as well as digital marketing strategy and support. To learn more about AquaTech and the AxisGo, visit aquatech.net or email cory@darbycommunications.com. Founded in 1998, AquaTech has been at the forefront as the leading designer and manufacturer of a full line of professional photographic equipment, specifically for water and extreme environments. Known for their heritage in sport housings, AquaTech products are used by the top photographers in the world of diverse genres including: surfing, sailing, documentary, fashion, fishing, Olympic water sports, and more. With products for photographers, by photographers, AquaTech’s offices are located in Thirroul, Australia and Huntington Beach, California. To learn more about AquaTech, visit www.aquatech.net.